Paycent believes in providing a tool for financial inclusion – for the unbanked and underserved. Since a decentralized economy has been established, we want people to know that we are a decentralized organization. We will issue a maximum of *insert number of token* during our ICO campaign. No matter who you are, you can become a contributor. Our Pre-ICO will start on the 12th October 2017 Thursday at Singapore Time 9AM (UTC +8). We are inviting everyone who are active on social media to help us spread the word. Help us reach the people across the globe, support us through Twitter, Facebook, Youtube, Bitcointalk, Blogs, and as a translator. Our target is to come up with 450,000 ETH contributions. This is a collaborative project, everyone can be an ambassador of change for the future of a decentralized financial economy. Details on how to be part of our campaign is listed below. The bounty pot will be split according to points accumulated pro-rata among the participants. Following the ICO, all stakes data will be calculated, whereupon the winners and bounties will be officially announced. Participants will be asked to send their ETH wallet addresses (e.g. https://www.myetherwallet.com/) to our email address to claim their bounty. A bounty pot of 4,500,000 PYN tokens or almost 2.12M USD (as of 13-Sept-2017, ETH to USD conversion) will be distributed among different channels. Each of Paycent’s ICO tweets can only be retweeted and commented once for points. This means up to two actions per tweet are rewarded with points. The retweet/comment has to remain posted for at least 1 month after the end of the campaign. Like our Facebook page for your stakes to count. Must have at least 50 number of friends/followers. Every week we will randomly select 10 bounty participants and check their “sharing” type. If their share is “private”, “single person” or any other, the participant in question will not receive any bounty rewards. Account or post about Paycent should be open to public. To determine your Facebook bounty stakes, Paycent needs permission to review your Timeline posts. No personal data will be stored or shared with third parties. Rewarding community members who use our tagline as their signature on Bitcoin talk forum. Each user earns +1 point per post with Paycent signature. To qualify, you must make at least 10 constructive posts per week. Required to contact us to register interest for this. 5% of the total bounty pool will be distributed to community members who translate and moderate our original post at Bitcointalk and act as moderators. Moderators answer inquiries from community members and keep the post alive. Paycent support team is permanently available to answer requests from moderators. Interested user needs to pre-register with us first. 15% of the total bounty pot will be distributed to Youtube ambassadors. Every Youtube channel with at least 500 subscribers has a chance to earn points in the campaign. Each unique video posted can only earn points once. It is posted at least 1 week before the actual token sale and remains posted after the campaign for at least 1 month. Present unique analysis/opinion of the project, as opposed to repost/translation. Remain published at least 1 month after the end of the coin sale. 10% of the bounty pot will be distributed to other translations. If our Bitcointalk post has not been translated into your language yet, we encourage you to contribute with your own translation and earn points in return. 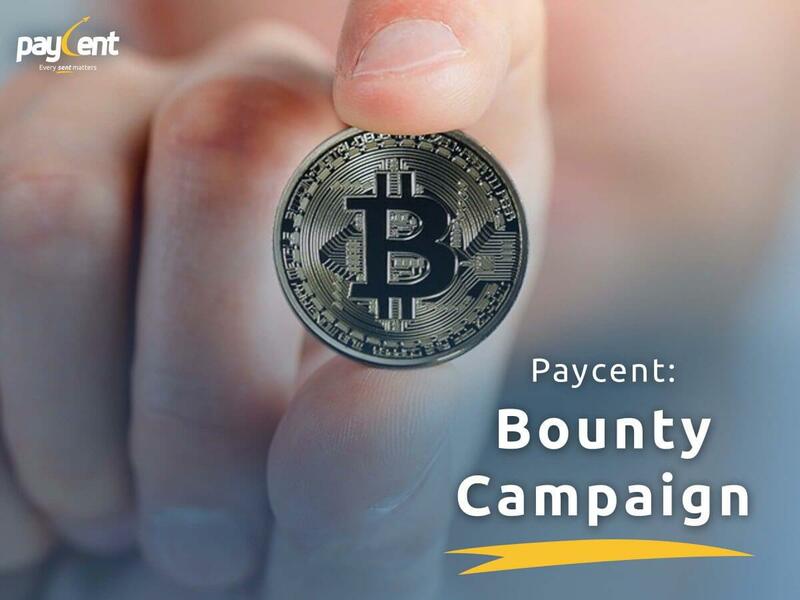 Please contact us at bounty@paycent.com to confirm and reserve your translation. You will receive additional points for each post you get in the thread of your translation. ICO pre-sale details will be announced exclusively via email, giving community members access to discounts up to 30%. On top of that, we are also distributing 5% of the total bounty pot between newsletters subscribers. To qualify, simply sign up to our newsletter at Paycent ICO website. If you have questions or suggestions about our bounty campaign, come join our community at our Bitcointalk thread or in the Telegram chat.